In most fancy restaurants I’ve been to, proper attire is considered to be a collared shirt — sometimes with a tie — and maybe even a sportcoat. In Indiana? As long as you have sleeves, yer good to go. And even though Illinois is only one state that-a-way, I’m sure they don’t mind their neighbor spelling it wrong. I mean hello? We’re Indiana! Why spell check on public signs? Can you even imagine how we’d massacre Hawaii? It’s a time like this that I ‘m not-as-proud to say that I am a Hoosier. I will say, though, in defense of my fellow Hoosiers (ahem…DAN QUAYLE), I was originally taught to spell potato with an “e” on the end. Hell, in Canada we spell all sorts of crap wrong. Do you know how frustrating it is to KNOW you are spelling a simple word like “colour” correctly and yep there it is that squiggly red line that shows up to tell me that Canadians are idiots. Really annoying! Camilles last blog post.."Ow–My Most of Me"
Hot damn! Sleeves and everything, must be part of a bridal party or something. Oh I miss Indy. I’m smiling that you’ve called “Smokey Joe’s Bar” a fancy restaurant. Never been to Indy but think I’ll appreciate that they make men wear sleeves. The only men who wear tank tops should be playing professional basketball, IMO. Fairly Odd Mothers last blog post..Yellow Bus Means GO! Maybe a little unfair though- I mean, Indy does have some very high end restaurants where jackets would be required, or at the very least very suggested. I know you’re not a native-Hoosier and I’m being a little defensive, but we do have class in Indianapolis. I think the sleeve requirement is because it’s a BAR. The spelling mistake though- well, I can’t defend that. What about the way some Hoosiers say “Illinois.” I always tell my Dad, “Illinois is a quiet state. No NOISE.” My Dad’s come back is usually, “Why would they put an ‘S’ at the end of a word if you ain’t supposed to say it?” Hard to out wit him with his grammatical prowess. Mandys last blog post..Tag – You are it! (Tagbacks allowed). Midwest Mommys last blog post..A Saturday Smile! I didn’t even notice the Illinois typo last night. Hilarious! And the icing on the cake was the homie walking by in his tank top. White Hot Magiks last blog post..Pigs, puppies and tiaras, oh my! Everyone always messes up Illinois, though usually when saying it, not when spelling it. Do you pronounce it with an S at the end? BECAUSE THE S IS SILENT. Karlys last blog post..Don’t Hate Me Because I’m Beautiful. Or Insane. The worst is when people pronounce the “s” in Illinois. Most of the time, I’d like to live anywhere but here in Indiana. I am proud of the number of cities and counties becoming smoke free though. 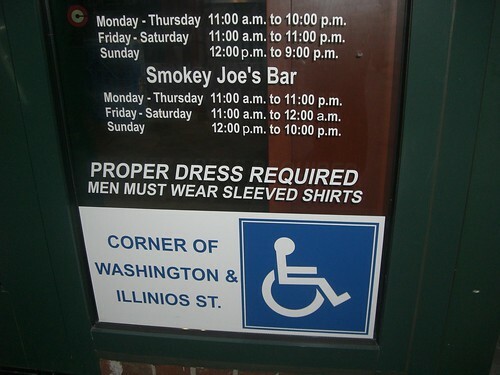 I’m of the opinion that an establishment named Smokey Joe’s should not have a dress code. Also, many places here (in Portland) do not allow men in flip flops. Rhis last blog post..Friday Bullets: Bye Bye Cyst Edition! Hey, I don’t care how people say Illinois…as long as they say moosh correctly. ah…the good ole illinios. my favorite stait. alis last blog post..the best laid plans. the garage abyss. the nudeys. Too funny!! I’ve stopped by on the recommendation of Neurotic by Nature. So glad I did. Have a great weekend! CONGRATULATIONS! You have won the Mrs Nespy’s Frugal World Gold Medal for August 9th. Go to http://mrsnespy.googlepages.com/grabyourmedalhere to get the code to post your medal if you’d like. Thanks for the great writing! I’m not sure what is worse, spelling it wrong or pronouncing the s.